Connecticut, playing as a No. 2 seed for the first time since 2006, began on a strong tear in NCAA Tournament first-round action Friday and never looked back, routing 15th-seed Towson, 110-61. All five Husky starters scored in double figures, led by Napheesa Collier’s 23 points and 14 rebounds. The Huskies shot 58.6 percent from the field, and 51.7 percent from three-point range. Katie Lou Samuelson, returning after missing the AAC tournament with back spasms, appeared to be perhaps three-quarters healthy. 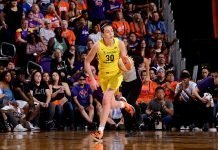 Her shooting was unaffected, but her defense and rebounding, which rely much more on twisting and shifting, were clearly hampered either by pain or anticipation of it. She played just 22 minutes, hit 3-5 three’s, and pulled down five boards. Towson was limited to just 14 percent shooting in the decisive first quarter and 31.5 percent for the game. The Tigers did pull down an impressive 21 offensive rebounds, but scored just 10 second-chance points. Kionna Jeter led Towson with 20 points and seven steals. She was the only Tiger in double figures. Despoite the easy win, the game did highlight some of Connecticut’s vulnerabilities, to which coach Geno Auriemma has alluded all year. In half-court sets, the Huskies had trouble getting into the paint. They were nearly out-rebounded, 41-42, and they gave up those 21 offensive boards. Despite the dominant first half, after which they led 64-24, they won the third period, during which four Connecticut starters played most of the minutes, by just six points. The Huskies advance to play No. 10 Buffalo at 7 p.m. Sunday. Despite the opinions of some that Connecticut was “cheated” out of a No. 1 seed, Auriemma was interested in discussing only Sunday’s contest against a team that shot 50 percent and hit 12-23 threes Friday. Alluding to a 1999 second round game in which the Huskies scratched out a win against Xavier on last minute free throws, he expressed his respect for what the Bulls have accomplished. Buffalo Coach Felisha Leggett-Jack deflected a question about Sunday’s match up with characteristic humor.